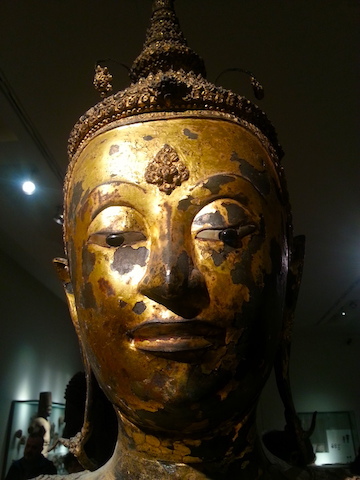 This is the second instalment in our 'Treasures of the Guimet' series. 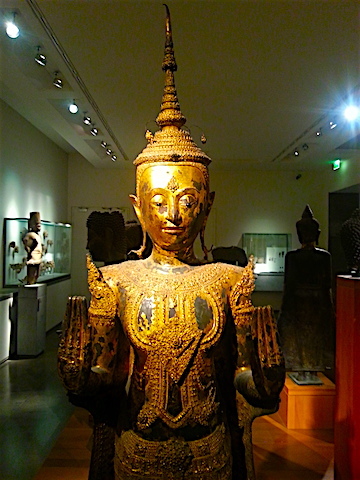 The Thai gallery at the Guimet Museum in Paris is on the same floor as the Angkorean galleries, but it's quite small by comparison. Thailand (or Siam, as it still was during most of the colonial period) was never actually part of French Indochina, although it did have to surrender its westernmost provinces in order to maintain its independence. It stands to reason therefore, that there wouldn't be an enormous number of Thai pieces in this museum. 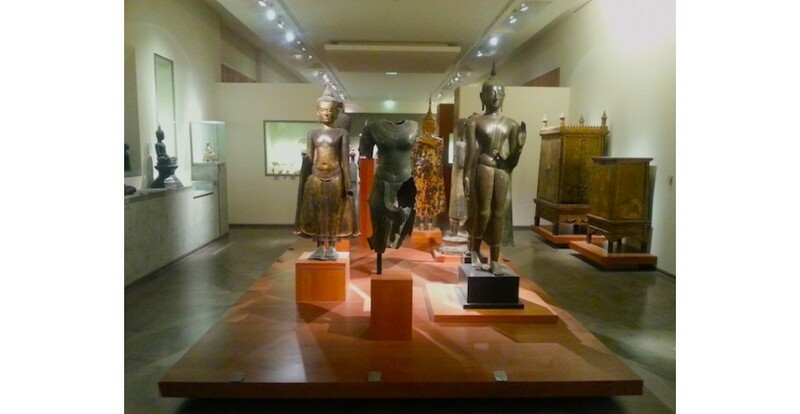 Most of the objects date from the Ayutthaya (1350-1767) and early to mid Rattanakosin (1782-present) eras. 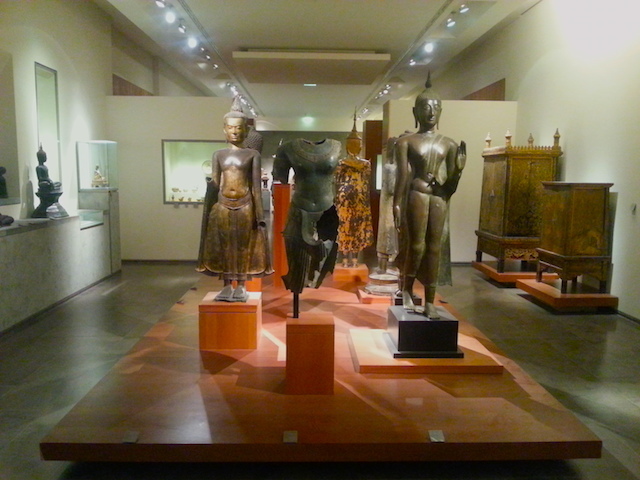 Below is a general view of the Thai gallery. The original gilding is still largely intact, which is remarkable. 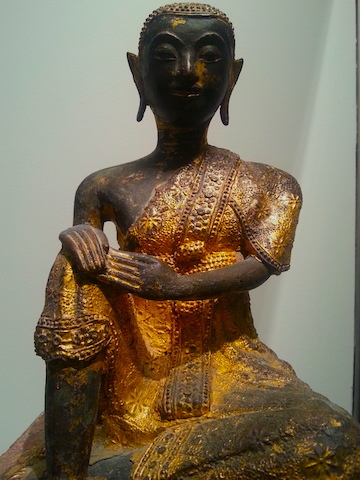 This piece dates from the above-mentioned Ayutthaya era. I find its face particularly expressive. Nearby is a seated monk figure. Figures of this kind serve as votive statues in temples. They must once have been quite popular in Thailand, to judge by the number of antique ones that you see in museums and antique shops, but you don't see them so much in contemporary temples, unlike in neighbouring Myanmar. The most beautiful one I've ever seen was in fact Burmese. It was in the Prasart Museum in Bangkok. So how do you know the difference between a monk statue and a Buddha statue? A Buddha will have the "Buddha bump" on the crown of its head, signifying wisdom. It's properly called the ushnisha. 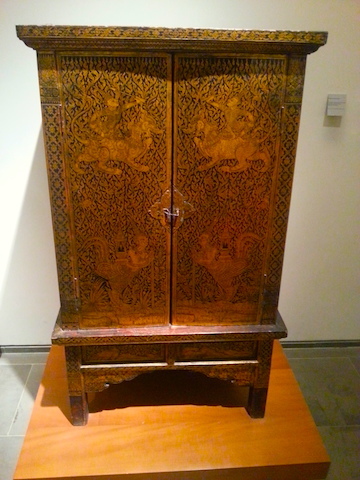 There is also some furniture in the Guimet's Thai collection. 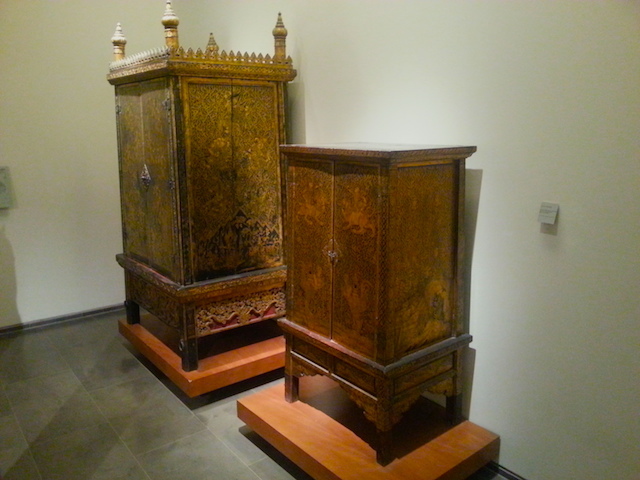 These gilded teakwood cabinets would have been used to store palm-leaf manuscripts, most likely in a monastery. According to the information posted onsite, they date from the Rattanakosin period, around the middle of the 19th century. Given the gilding, they must have been in very well-endowed, possibly royally-endowed, temples. King Rama III, who reigned from 1824 to 1851, was a prolific builder and embellisher of temples and monasteries in the capital and his richer subjects followed his example. I took a close-up photo of one of these cabinets. I'd say the Chinese influence is obvious, wouldn't you? The junk trade with China was in fact at its height during the reign of Rama III. Finally, I photographed the small selection of ceramic items. 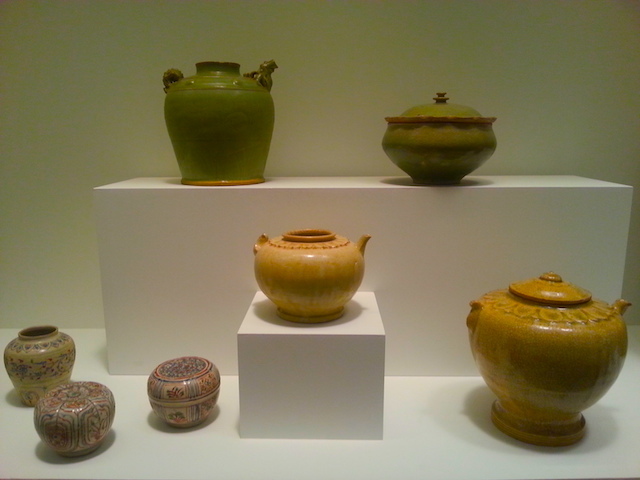 Thai ceramics are less well-known than Chinese, Japanese, or even Korean, ceramics. Celadon pieces are made in Thailand, too; to my eye, they are a richer shade of green than pieces made in the above-named countries (see the pieces at top in the photo above). Probably the best known Thai ceramics are bencharong (also spelled benjarong) pieces. They have a five-colour finish. There's now going to be a pause in the series. I'm actually going to Paris soon, and I plan to visit the Guimet to get some fresh photos. Watch this space! Did you know that Lotus & Persimmon is on Facebook and that we also have a gallery on Instagram (@lotusandpersimmon)? Please 'like' and follow! Click to see highlights of the Guimet Museum's Angkorean treasures. Find out where L&P likes to eat and drink in Thailand's capital.